An air ambulance helicopter hovers over the hospital during the Rupert Fourth of July parade after the pilot spotted a drone flying in the vicinity. 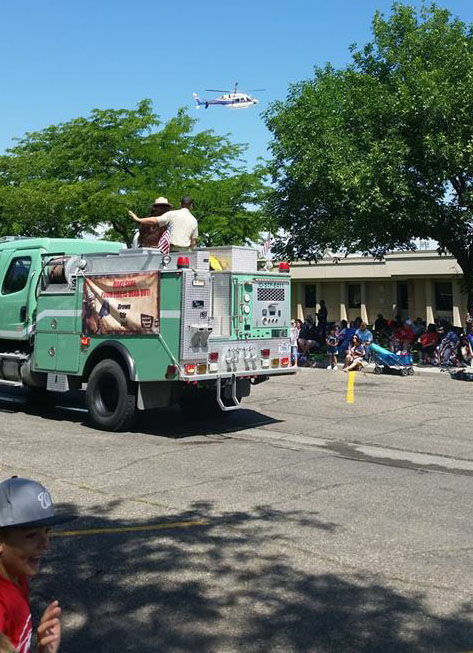 RUPERT — A drone in flight over Minidoka Memorial Hospital created a hazard for a medical helicopter crew during the Rupert Fourth of July parade and delayed transport for a patient involved in an interstate crash. Hospital employee Tammy Hanks said she was videoing parade footage when the incident occurred. Minidoka Memorial Hospital Administrator Tom Murphy said the helicopter was trying to land at the hospital to pick up a patient that was in a crash on Interstate 84. “The chopper coming in spotted the drone and called the dispatcher,” Murphy said. Luckily, he said, the pilot spotted the drone and bypassed what could have been a worse event. The drone could have caused a crash and endangered the flight crew and patient along with other hospital staff and bystanders, he said. Hospital officials ask the public not to fly drones within two miles of the hospital. Rupert Police Lieutenant Jeff McEwen said he was in the area by the hospital when he heard the police chief say over the radio that there was a drone being flown near the hospital. Because the man was compliant and did not realize the turmoil he was causing, police did not forward a report to the Federal Aviation Administration, and no criminal charges were filed. Brandi Milliron, who teaches drone classes to students at West Minico Middle School said drone use exploded before guidelines were established. The task was turned over to the Academy of Model Aeronautics, which established the guidelines later adopted by the FAA. Milliron said most drones equipped with cameras today won’t even power up unless the user has read the rules and regulations on its use. Officer James Bonzo, who flies the Rupert PD’s drone, said there are FAA rules for recreational drone use and state and local ordinances also apply. Idaho laws prohibit flying unmanned aircraft over private property or for voyeurism and agriculture structures cannot be filmed. Other laws prevent the sale of images or video without the consent of the property owner. A person violating the law could be charged with reckless endangerment, criminal mischief, voyeurism and inciting violence, depending on the circumstances. Penalties could include civil action and fines of $1,000 or actual damages. FAA rules for recreational use include yielding to manned aircraft and giving notice to the air traffic control tower when a person flies a drone within five miles of an airport. The FAA’s smartphone mobile app B4UFLY is available for free and helps unmanned aircraft operators determine if there are restrictions or requirements in effect at the location where they want to fly. The FAA gives hobbyists two options to fly unmanned aircraft under a special rule. The first requires operators to register the craft with the FAA, fly for recreational purposes only, follow a community-based set of safety guidelines, fly within visual line of sight, give way to manned aircraft, report to the air control towers when flying within 5 miles of an airport and fly a craft that weighs no more than 55 lbs. The second option requires the user to register with the FAA as a non-modeler, obtain an FAA remote pilot certificate and follow the agency’s operational requirements. Operators can also request a waiver from the FAA to operate within the 5-mile rule or during certain conditions, like flying at night. FAA rules also restrict flying in the airspace around Washington DC and any prohibited, restricted or warning areas, military operations, alert or controlled firing areas. Drones should not be flown around stadiums and sporting events for major or national leagues along with others, around wildfire firefighting operations. All accidents involving serious injury to a person or property damage in excess of $500 must be reported to the FAA within 10 days. Pilots should fly at or below 400 feet, avoid gathering places of 3,000 people or more and emergencies and not operate a drone while intoxicated. Flying drones for work or business purposes falls under a different set of rules. But Milliron said, anyone receiving financial compensation for video or footage—even from Youtube—must complete the requirements to fly commercially. People flying drones in rural area should also be mindful that farmers may be flying spray planes in the area, Bonzo said. Milliron said hospital helipads will show up in the B4UFLY app but private crop duster airstrips do not and those planes fly under 400 feet. “People have to be aware of their surroundings,” Bonzo said. The police are starting to receive more drone complaints than in past years. “Most of the complaints are coming from residents who are concerned about the cameras that can be attached to them,” Bonzo said. The Rupert police station has not written any citations for drone use, yet, McEwen said. Drones can be fun and very useful, McEwen said. The police department has used a drone for about a year. It affords officers a bird’s-eye-view of areas and has been used downtown to check out the rooftops before large events like the parade. Bonzo said the drone was used to make sure there were no unauthorized people lurking on the roofs or suspicious objects. “It works well to increase public safety,” McEwen said. The department has also used it a couple of times to quickly scan canal banks when parents reported missing children, Bonzo said. The aircraft provides a valuable resource for a small department with less manpower, McEwen said. The drone can also be used to map crime scenes or accidents and for criminal surveillance but only after a warrant is issued, McEwen said. Many businesses also use drones for various purposes. Murphy said he’s not against the recreational use of drones and his son owns one, but users have to obey the rules. “I want people to follow the rules so we can continue to have fun flying these drones,” Murphy said.